Poor Badfinger; if ever there was a pop group “born under a bad sign” it was them. Things started off quite auspiciously. As The Iveys they signed to The Beatles’ Apple Records and had a hit single. However, they decided that their name, and their image were a little old fashioned and for reasons that remain obscure they also decided to change their guitarist. Exit Ron Griffiths and enter Joey Molland. Badfinger was born. They had hit singles with the Paul McCartney penned Come and Get It (recorded just as Griffiths was leaving the band) and No Matter What, and perhaps their greatest moment was when Harry Nilsson had a massive worldwide hit with their song Without You in 1972. After that it was all downhill. And downhill very very fast. The band were the last non-Beatles artists to release an album on Apple, and a move to Warner Brothers was not a success. There were grave management issues (which were so contentious that even now it is probably not safe to put in writing) and – probably as a result of these internal pressures – two members of the band (Pete Ham in 1975 and Tom Evans in 1983) committed suicide by hanging. Joey Molland, who had written the vast majority of the group’s later output, remains an immensely under-rated and very talented songwriter, whose career has been blighted by the appalling catalogue of disasters which had overtaken his band. This collection of demos from various parts of his long career only proves to confirm, (as if any confirmation were needed) what an extraordinary songwriter this man is. Originally from Liverpool, Molland now lives in America, where he continues to write and perform some beautiful music. Let’s hope, with the re-release of this fantastic record that is star is finally in the ascendant. If so, then there really is some justice in the universe. After reurn To Memphis now another release of old recordings of the ex Badfingers , Joey Molland .This demo recordings are submitted, created - note the indications of the song titles - in the period from 1972 to 1995. Accordingly, also make the difference in sound, in art and in songwriting. Some songs have been played just about simple rhythms simple drum machines, other completely solo and pure, and others with full band. Regardless of how to present the individual pieces, they basically show the ability of the musician to write good songs. Times it rocks with a certain punk attitude ("I Said It's Alright '92"), then it sounds like dry rockendem Pub Rock ("Borderline '84") and also a small hint of the status quo is not missing ("Birdsong '92 "). Some songs sound very unfinished, such as the tracks four and five. "Miss Misunderstood '72" is very simply structured, accompanied only by acoustic and recalls regarding the composition strongly to Paul McCartney . Other radiate precisely because of the reduced form, such as the very successful in my opinion, accompanied only by the guitar "Moonlight". Again a little ' Beatlesque'sounds "Is not That A Dream '95" - more precisely, by George Harrison . "It's True '88" bears traces of the British musician colleagues Bryn Haworth , making it possible to detect many different influences as well as associations. "Sometimes" is likely some fans even in the version on the 1971 album by Badfinger be known, "Straight Up" it said. It would be nice with some titles if you could enjoy them again as completely worked-out pieces. What remains is a record that should inspire mainly fans because wide spread good for the compilation unfortunately certainly not even as an appetizer for the music Joey Mollands . Joey Molland is probably best known for his work in Badfinger. He’s done a lot of solo music, though. This album collects a lot of his demos over his career. As with most demos, these sound a little rough around the edges. There are definitely some diamonds hiding on a lot of these cuts, though. This straight ahead rocker reminds me a little of Bad Company. Of course, there is also some Badfinger in the mix. It’s definitely raw like a demo in terms of production. The song, though, shines even in the rough. More of a stripped back rock and roller, the harmonica lends a lot to the mix here. While this is still “demoish,” the quality is better than on the previous tune. That Bad Company element is still here, but there is some Muddy Waters and some Led Zeppelin built into this beast, too. A bluesy rock and roller, this is not bad, but a little raw and a little unremarkable. This has a clean guitar sound. It’s echoey and distant in the demo quality. It’s also a cool tune. It’s more of a melodic rocker and there are hints of space rock here. A false ending gives way to a reprise that’s even more space rock. That section is short and purely instrumental, but also very cool. More of a psychedelic rocker, this is a good tune. It’s still demo quality, but better than some of the rest. The bridge is more along the lines of Badfinger. More along the lines of power pop, this has a little bit of a Rolling Stones vibe to it, too. The mix on this is rough, but not rough enough to keep the song itself from working. This isn’t all that special, though. This is one of the best songs of the set. First, the recording is better than some of the rest. Then, there is the tune itself. It has some vintage rock in the mix along with psychedelia and even hints of prog. It’s a melodic rocker that works really well. More of a folk rocker, there are a lot of Beatles elements here. This really feels like Badfinger. It’s definitely demo quality, but good demo quality. The guitar solo brings some hints of country. This is a cool modern sounding rocker. It’s accessible and energetic. It’s also one of the least demo-like in terms of sound. This is one of the highlights here. The sound quality on this one is pretty good. It’s an acoustic guitar based, folk rock styled number. It’s not one of the best of the set. I love the intricacies of the acoustic guitar lines on this one. It’s also an acoustic based, mellower tune. It’s sublime, though. This is one of the best here for sure. There are Beatles-like elements. The recording quality is quite good for a demo, too. This melodic rocker is okay, but nothing special. It’s got a drum machine backdrop and is quite demo-like. An acoustic guitar based folk rocker, I like this one a lot. A raw, punky rocker, this is just not all that special. It’s quite definitely a demo, too. The drum machine at the start gives this up as a demo right away. It’s a cool, echoey, psychedelic rocker, though. It’s quite a good tune, and the bits of demo-ness actually add to its effectiveness in some ways. There’s an energized glam rock texture to this one. It reminds me of Sweet a bit. It’s a fun rocker and the sound is quite good, if a bit flat. Here we get another version of the earlier track. It’s not as good as that one, I think. This is pretty lackluster. After the extraordinary reception that had the album Return To Memphis from Joey Molland , legendary member ofBadfinger , the British publisher Gonzo Multimedia found interesting sites to market two rare titles by the same author: one is a reissue of the album This Way Up from 2001 (we'll talk more in detail it soon); the other, what concerns us now is Demos Old And New . As the name implies, this disc is composed of a series of releases demo of themes ranging from 1972 ( Miss Misunderstood ) until 1995 ( Is not That A Dream andMirrors ) run for five line-ups different, with more than half just by Molland on guitar (acoustic many times) and voice. Interestingly, three of these themes, Is not That A Dream and Mirrors (1995) and still Moonlight (1981) appear in another disk now reissued, This Way Up . The first half of the album with a full band (or several, in this case) has very interesting topics versions of real rock n roll . Of particular note the use of harmonica, courtesy of Joe Savage , the themes of 1984, Borderline and Can't Stop or presence of the duo Eric Bretl / Gregg Eiden , in 1992, to excellent I Said It's Alright and Birdsong . 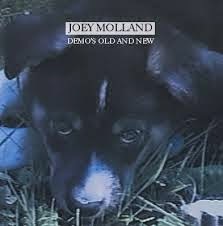 To the end, the demos are homemade with only Molland and, of course, there are some good ideas, it is natural that the final result is not as exciting as having a real band and complete the run. Still, for those who followed the careers ofJoey Molland or even of Badfinger , this is a collector's piece with some interest. "Demos Old And New" by Badfinger legend Joey Molland collects seventeen recordings from as far back as 1972, through the '80s and the '90s. Each track is pretty short, with lots of blues ('Borderline,' 'Cadillac Blues'), while 'Clouds Of Love' has a bit of a punky vibe. 'Panning Gold' from 1982 seems to plumb electro depths, but it's the '70s material that stands up best: 'What You're Doin',' 'Miss Understood.' This album is pretty sought after, so it is another welcome re-release from Gonzo.